With a darkish black/brown wrapper, which is velvety to the touch, this box pressed torpedo (the only vitola they offer according to their website) looks expertly put together. Firmly packed with a bit of oil on the wrapper, I can’t see much wrong with the way this cigar looks. Sure, there’s that one rogue vein near the head of the cigar but that’s not going to cause a problem for the draw or anything else that actually matters in terms of taste and whatnot. The prelight draw is a bit tight but, based off of the other one I smoked, that will not pose a problem. A hard, bright spice is the first I noticed when I started this cigar. There’s also a strong peppermint flavor going on, which is unique in my cigar smoking experience. In the background we can also find some cocoa and some other complimentary flavors. It’s really an interesting mix and it wasn’t what I was expecting when I first tried this cigar. It’s weird but in that good, Memento sort of way. (I would try to wring every last drop out of the Memento comparison but I don’t think a cigar review would be that enjoyable to read backwards.) Peppermint is the main flavor I’m getting during the second third followed by spice, some dark (but definitely background) wood notes and a bit of rich earthiness on the aftertaste. Peppermint basically disappears during the first part of the final third as an ascendant barbecued meatiness takes over. Some sweetness does come on at the tail end but it would have been better if it had been around for the full third to provide a nice counterbalance to the somewhat off putting barbequed meat flavor. 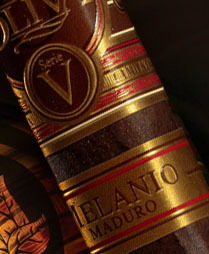 Medium-full bodied with a good draw and burn, the Oliva Serie V Melanio Maduro is a worthy addition to the Melanio line extension. It was a very interesting cigar during the first two thirds and I sincerely enjoyed how the peppermint played off of the other flavors. The final third, on the other hand, was a bit of a dud. Still, I think the first two thirds are worth it and, with some age, I’m sure the final third will round out nicely. Did I like it more than the original Melanio? Yes, but barely.